According to a new national survey from Ottawa-based Abacus Data, the Conservative Party’s nine point lead in March has evaporated and they are now only two percentage points ahead of the federal NDP led by its new leader Tom Mulcair. 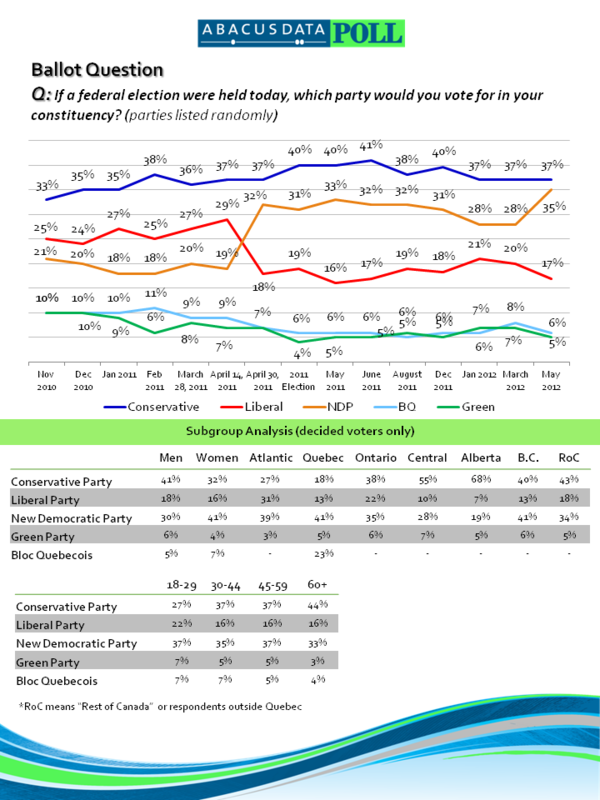 Nationally, the Conservative Party has the support of 37% of decided voters (unchanged since March), followed by the NDP at 35% (up 7 since March), and the Liberal Party at 17% (down three since March). The Bloc Quebecois’ brief lead in Quebec measured in March is now gone as it has fallen ten percentage points to 23%, 18-points behind the NDP. Regionally, the Conservatives continue to do well in the Prairies (55%), Alberta (68%), and BC (40%) although they are tied with the NDP in Canada’s westernmost province. In Ontario, the gap between the Tories and the NDP has closed to three points from ten in March. This is our first poll since Tom Mulcair’s win as NDP leader. His selection has helped the NDP regain a significant lead in Quebec. The NDP is at 41%, followed by the BQ at 23%, the Conservatives at 18%, and the Liberals at 13%. Along with vote intention, Abacus Data also tracks opinion about the general direction of the country, approval of the federal government, and the favourability of federal party leaders. 38% of Canadians surveyed believed that things in Canada are heading in the right direction while 48% believed things are headed in the wrong track. This is largely unchanged since March. Quebecers continued to be the most likely to believe the country is headed in the wrong direction (65%, up 10 since March). The approval rating for the federal government led by Stephen Harper is unchanged since March with 37% approving and 49% disapproving. Evaluations of the government’s performance in managing the Canadian economy have changed very little since March. Overall, 37% of respondents approved compared with 36% who disapprove. Thomas Mulcair is the only federal leader with a net positive favourable rating. Thirty-six percent of respondents said they have a favourable impression of the NDP leader while 21% said they had an unfavourable impression. One in three respondents said they had a neutral impression of Mr. Mulcair. Bob Rae’s personal numbers continue to trend negatively with 22% of respondents saying they have a favourable impression of the interim Liberal leader while 38% said they have an unfavourable impression. One in three respondents said they had a neutral impression of Mr. Rae. Prime Minister Harper’s personal numbers are unchanged from March. Thirty-seven percent of respondents said they had a favourable impression compared with 49% who said they have an unfavourable impression of the Conservative Party leader. The election of Thomas Mulcair has, at least temporarily, increased the competitiveness of federal politics in Canada. The federal NDP is within two percentages points of the incumbent Conservatives and are polling at its highest level since Abacus started polling federal vote intentions in November 2011. Mr. Mulcair has the strongest personal numbers of all the federal leaders. He has helped the NDP regain the lead in Quebec while making inroads in Ontario. It remains to be seen whether his comments about the oil sands and “Dutch disease” will hurt the NDP’s numbers. Nevertheless, the first month and a half of Mr. Mulcair’s leadership has been good for him personally and for the party. He is on the right track to consolidating the centre-left vote. Will the surge last? The Conservatives, despite a number of controversies, remain at 37% among decided voters and unchanged since the beginning of 2012. Despite the steadiness of their numbers, the government’s approval rating, the personal numbers of Prime Minister Harper, and the right direction/wrong track remain weak. While the Conservative Party’s base has remained loyal, the party has lost the support of many of the swing voters who gave the party its majority in 2011. 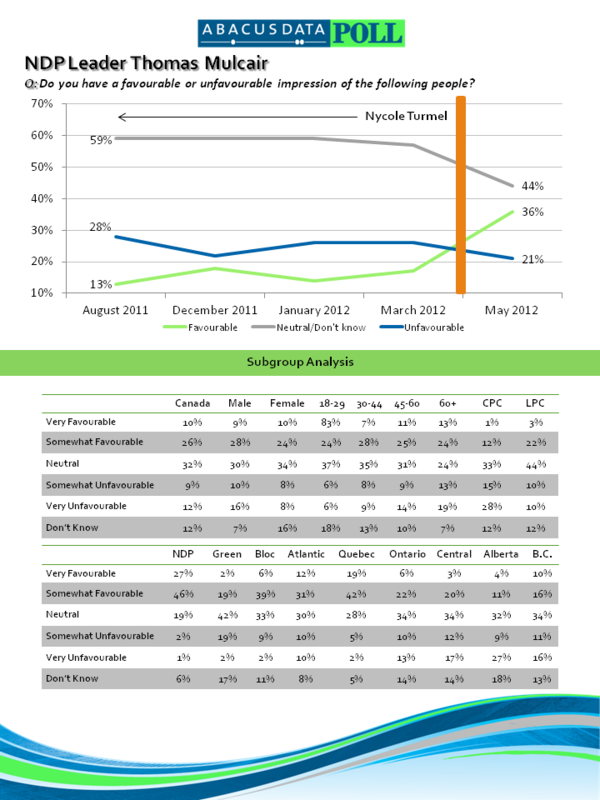 Its performance on the economic management file is the only good news coming out of this month’s poll. The poll’s results for the Liberals are perhaps most bleak. The Liberals are down to 17% nationally and have lost support in Ontario and Quebec to the NDP. After peaking at 21% in January 2012, the Liberal numbers have dropped four points. The NDP is now neck and neck with the Conservatives which will likely put more pressure on the party’s fundraising and candidate recruitment as the NDP continues to position itself as the only party that can defeat the Conseratives. More worrisome for the Liberals may be the fact that its interim leader and much rumored front-runner for the full-time job is the least liked federal leader. If Mr. Rae decides to run for the permanent job, he would enter the race with very weak personal numbers, particularly in Ontario where 47% of respondents said they have an unfavourable impression of the interim Liberal leader. Is there good news for Mr Rae? Yes in that 61% Liberal Party supporters have a favourable impression of him compared with only 13% who have an unfavourable impression.